On our all day journey from Rapid City, South Dakota, home of Mt. Rushmore, to Minneapolis, Minnesota, home of the lesser know Museum of Questionable Medical Devices, we stopped in Wall, South Dakota. The main draw of Wall? Why Wall Drug of course. Maybe you've run into signs, they're all over the world touting "3,185 miles to Wall Drug!" What's so great about Wall Drug? Why is the parking lot packed with cars and the store packed with people? Probably, because this is the quintessential old-time Roadside America. Ted and Dorothy Hustead bought the Wall Drug Store in the height of the depression in the middle of nowhere. Mt. Rushmore was still under construction, so they weren't getting many customers. One day Dorothy mentioned to Ted a way they could get travelers to stop in the drug store. Free Ice Water. So, Ted put signs up on the highway reading "Get a soda...Get a root beer...Turn next corner...Just as near...To Highway 16 & 14...Free Ice Water...Wall Drug." 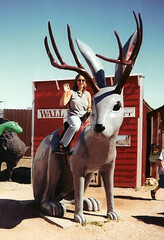 Thus began the famous Wall Drug, now filled wall-to-wall with animated dinosaurs, statues, jackaloupes and other oddities. They still serve free ice water and sell normal drug store items squeezed in between the gift shops and cafe. Well, worth stopping at for a glimpse of old time Roadside America.